This month’s awesome opportunity from Stonyfield Farms was just too good to be true. I feel like I have every kitchen gadget and serving dish that anyone could want – although there was always the missing egg tray. I love making deviled eggs, but I just never saw the absolute need to get one. 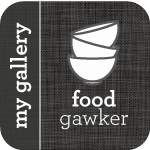 You can find many deviled egg recipes on this blog, with pictures either taken on a regular tray or a slightly interesting shape – but none on a traditional egg tray. When Le Creuset sent this deviled egg platter – I was beside myself. But wait, there was more – I also received some amazing kitchen tools from Kitchen IQ. Some stackable measuring spoons, and cutting boards. These very flexible cutting boards have a non-slip surface underneath – shear genius. I have been using flexible cutting boards for a while, but I always have to add a non-slip mat underneath so they don’t slide all around. Both of those came in handy when making these eggs – and now those cutting boards are the ones I go to first when I start chopping. Please note: As a Team Stonyfield ambassador, I am being compensated. All opinions about StonyField Farm’s products, Le Creuset and Kitchen IQ are always my own. Boil 12 large eggs so the yolks are medium-rare, about 8 minutes. This keeps the mixture rich and not dry. Shock the eggs in a bowl of ice water, then peel and halve the eggs lengthwise with a sharp knife, wiping the knife clean between each egg. You can just mash the yolks with a fork in a small bowl, but for a totally lumpless filling you can use a food processor. Add 1/2 cup of yogurt and 1 tablespoon truffled mustard to the mashed yolks. Season the mixture with kosher salt and pepper and stir until creamy. If you’re making the filling ahead, store it in the fridge and fill the egg white halves just before serving. Spoon or pipe about a tablespoon of filling in each of the egg whites. Fry the chopped pancetta in a saute pan until crispy. Drain the fat and let cool on some paper towels then sprinkle on top of egg filling along with the chopped chives. Do this just before serving so the pancetta stays crispy. 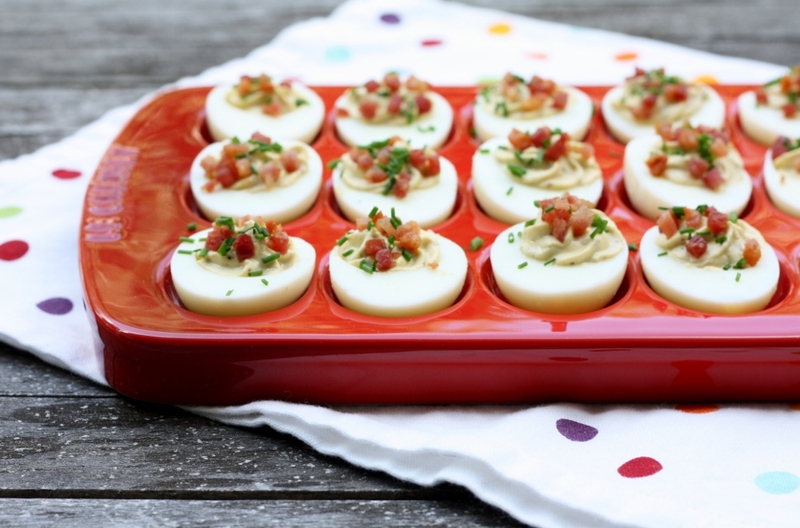 SUCH a gorgeous, fun spin on deviled eggs. And I’m totally loving the tray! Yes please… They look delicious! And yes, us too now that we’ve made deviled eggs with yogurt–we won’t be going back!